03/01/17 – Proof that Activision were to be the publisher in 1989, added to scans. 30/09/16 – Game fully recovered and preserved. Exodus was to be a very ambitious wargame which was described by its developer as a mix of Elite, Civilisation and Traveller RPG. Paul Clansey was the C64 developer and shed some light on a development not really mentioned in the press, as you can read in “Creator Speaks”. 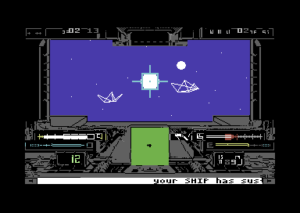 Whilst Paul coded the C64 edition, Ian Weatherburn was producing the ST edition around 1988-89 for a company called New Frontier Productions. 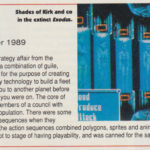 The game was designed by Tony Hetherington and there were possibly others working on the ST version with Ian. 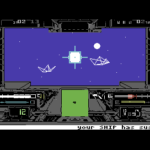 It seems that based from Amiga Power magazine, the game was intended for release by Activision in late 1989. The game itself was a space RPG and economic trading wargame, which was very ambitious for the team and very well presented (with excellent graphics by Tony). Proper storyboards and sketches were produced throughout the development as part of the planning (which sadly seem to be lost to time now). 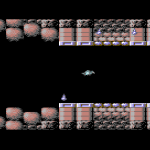 Paul felt it was a mash up of best bits from other games, and needed work to tie it all together, but there were struggles with getting the wireframe sequences running at a decent speed on the C64 in particular. Over time, the company were not happy at all with progress, and it was cancelled before it could get much further. 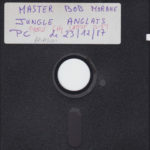 In 2016, Paul was sorting out his notes and materials to help with a magazine interview, when he uncovered a disk of a demo sent to EA at the time. This was sent to GTW and fully preserved, and now with Paul’s permission we are able to present the final version of the game as it stood. There are two parts in total. It seems the first part of Exodus (“trd” on the disk) is the trading part of the game. This has the menu system in place and a lot of options to play with. 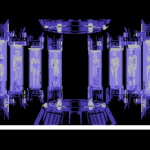 The second part (“arc” on the disk) is the arcade/Elite wireframe part. Load the “LOADT” and “LOADA” files to load either part in correctly. At the moment, we don’t fully understand what it is you have to do or what all the controls are, but Paul will hopefully shed some more light soon when he’s had chance to play through and work things out again. As you will see, the wireframe part is unfortunately very slow – but it is likely there could have been improvements had time been given. It does look very impressive even at this early stage. Check out a promising title that was never to be, and we hope to have more details on it soon. “I was coding the C64, Ian Weatherburn the ST, it was sometime around 1988-90. I think that the company was New Frontier Productions (don’t know what else they did) and that it was designed by Tony Hetherington. The design- a space RPG and strategic economic wargame- was extremely ambitious and impressively presented (looked like a lot of effort had been invested in storyboards and professional-looking sketches for the graphics). A fantastic find, but horrible to hear of Ian’s suicide.